TO MAKE a difference in someone's life and see them change for the better was what motivated Lauren Croft to start up her aquatic physiotherapy business. Physiotherapy 2 Go has just opened for business and owner Ms Croft is eager to let Biloela residents know she is ready to provide therapy. "Doing aquatic physio is different due to how the work and rehabilitation is carried out," Ms Croft said. "It can be easier or harder due to resistance and depth of the pool we utilise for the therapy." 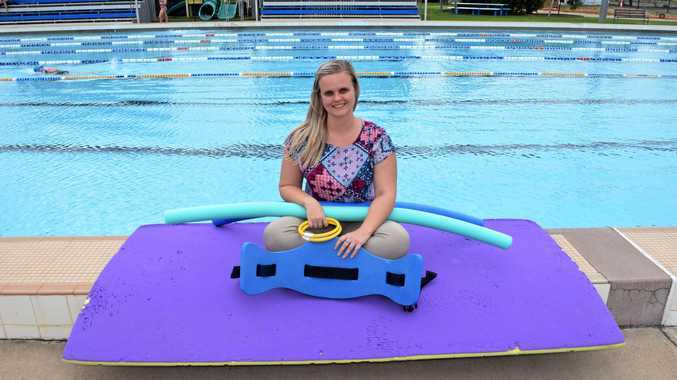 Ms Croft had her 'light bulb moment' to pursue aquatic physiotherapy when she was at Caboolture Special School. "It was the Noosa Triathlon and a student I had helped made huge gains through aquatic therapy to assist him to get over the finish line," she said. Ms Croft has a Bachelor of Physiotherapy through Australian Catholic University in Brisbane and graduated in December 2016 with the Dean's award. "It doesn't matter if you can swim or not, it shouldn't stop you from coming down to have a go at aquatic therapy," she said. Physiotherapy 2 Go can help with sprain or strain rehabilitation, sporting injuries, neurological conditions, pregnancy- related issues and other disabilities. For more information, contact loza.croft@gmail.com or 0437586348.